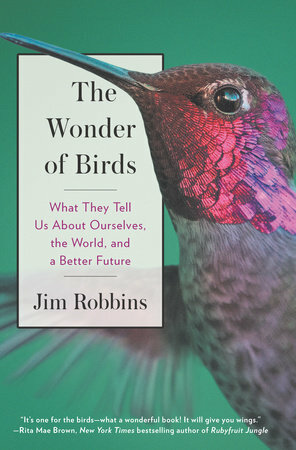 Jim Robbins, The Wonder of Birds: What They Tell Us About Ourselves, the World, and a Better Future. New York: Spiegel & Grau, 2017. This is a fun, interesting and thought-provoking read. You can catch bits and pieces of similar thoughts and developments related to birds in news outlets and specialized journals, but it's helpful to have a bunch of them concentrated and reviewed in one place. I knew from previous reading that crows are smart, but there's always more to ponder. For instance: "It depends on how you define it, but the most intelligent corvid could be the New Caledonian crow, which is also in the running for the smartest animal on the planet." (page 155). It's funny, because a few days after reading the section on crows, while I was at a red traffic light, I looked over and saw a crow in the median, holding with one foot half a muffin, still partially wrapped in paper; while with the other foot, said crow pushed the paper off, so as to get at the delectable morsel inside. Groovy, man! All before the next green light. In any case, Robbins gets into migrations (what do they mean? How do they work? How is human activity disrupting patterns and habitat? ); ideas like "emergence" and "murmurations" (mass avian spiral patterns) and neurogenesis (regeneration of thinking bits), theory of mind (being able to suss out other creatures' desires, &c.), chronesthesia (mental projection through space and time) and panpsychism; and sudden species collapse (such as of the passenger pigeon). The Wonder of Birds contains a lot of big ideas, and many specific examples of bird types and behavior, plus much about the positive impact of birds biologically and culturally. Only in his consideration of cities / urban areas does Robbins step into weirdville: Tesla and pigeons, social work with eagles and other bizarro tales. I think that if Robbins has a blind spot, it's in "pigeonholing" cities, reducing them to one imagined uniform place where people are so "hyper-focused" that they barely realize the presence of birds, &c.
Because there are many varieties of urban spaces, depending on geography, population size and density, planning, presence of nature preserves, cultural attitudes, historical factors and everything in between. One thing I can assure him: I've never been to a single city anywhere in the world that only contains pigeons. 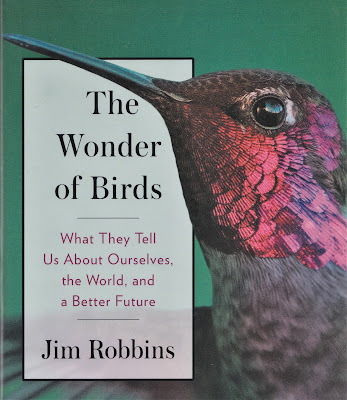 Other than this urban quibble, I'm good with The Wonder of Birds; certainly I'm an advocate for the book and for birds and sustainable ecosystems. Essential to the future, given the outlook: "Temperatures and ocean levels, already on the rise, will increase further as the climate changes . . . more, and more immense, hurricanes and other storms, withering drought, punishing floods, and destructive winds." (page ). And don't forget the hummingbirds! From what I've seen, they're very competitive, and I can often pick one out in a tree, placed for optimum interception of other hummingbirds, sometimes chirping out a sort of tiny, fast Morse Code. Gonna tell Lana about this. This is something our library should carry.